Wedding music is an integral part of your wedding day. It is this intangible link that bonds everything together and creates a lot of memorable moments for you and your wedding guests. From the wedding march to your first wedding dance and all the way to the after party dance craze, your wedding music will be one of the highlights of the big day. The top advice you’ll get if you’re planning a wedding on a budget is to hire a DJ instead of a band. We completely support this decision as hiring a band for your wedding is not only expensive, but also risky as there is always the possibility for something unexpected to happen. You can cut your DJ costs even more if you hire 2 DJs (a less experienced one for the cocktail hour and the more experienced for the real thing). Depending on the number of your wedding guests (and the “tone” of your wedding), you can ask a friend or a family member to perform at your wedding. One in every 20 people turns out to be a decent singer… Why not give it a try? It could turn out to be a great success and it will certainly add a personal touch to the ceremony and/or the reception party! 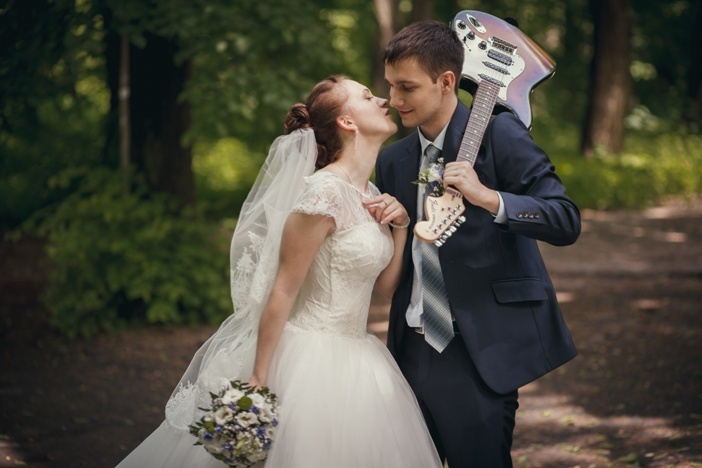 With a little creativity you can easily find both musicians and singers who would be more than happy to perform at your wedding on a pretty decent budget. Just look for music students or consider hiring a DJ, musician or a band who is new to the wedding music business and they will give their best, hoping for you to refer them to a friend! Just like all other aspects of the wedding (like the venue, the ceremony, the photographer, the wedding menu, etc), wedding music (or any other kind of live entertainment) will cost you less if you choose to get married in the low season. If you insist on a high season wedding, then choosing a more appropriate day for it (e.g. Friday or Sunday) may significantly cut the costs for wedding music. So, you have made your decision and now it’s time to negotiate. Do not be shy and ask for different options to choose from. Perhaps there is a discount if you pay the whole amount upfront? Or your chosen DJ/band has a current promotion you are not aware of? It’s always a good idea to check their website and social media before you negotiate the final prices as it often turns out musicians and DJs have special discounts reserved only for their Facebook/Twitter fans!